State Farm® understands moving to a new community isn't always easy, and we’re here to help with moving tips from State Farm Agent Jose Martinez. Jose immigrated to Brentwood, California from Mexico 50 years ago, so he knows a thing or two about making a new community feel like home—like how important it is to volunteer. Finding volunteer opportunities is one of the best ways to feel at home and connect with people in your new community. Volunteering can help you meet new neighbors, make new friends, and network with new people. Even more importantly, giving back gives you the chance to create real and lasting change, to make a difference in people’s lives, and to be part of something bigger than yourself. How can I give back in my community? Find the issues that move you and inspire you to act. Assess your skills and abilities, and be honest about what you can offer. Look for opportunities and causes that could also stretch you a bit. Prevent burnout by leaving time for friends, family, and yourself. Bring along your friends and family to make the experience even better, and to help the cause even more. Do some research to see how your time and energy can make an impact. When you make a real difference, you'll feel a part of the community. 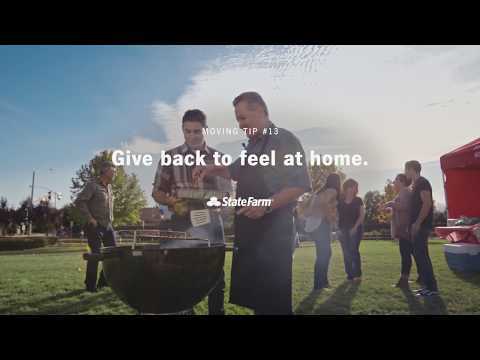 At State Farm, helping people is at the core of who we are and what we do, and we’ve made it easier than ever to give back. Visit Neighborhood of Good® to choose a cause that matters to you, and type in your ZIP code to find local opportunities in your area.